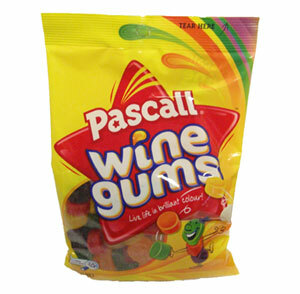 Put more colour in your cheeks with these classic wine gums. Soft, chewy lollies bursting with fantastic fruit flavours. Glucose Syrup (from Wheat and Corn), Sugar, Thickener (E1401 (from Wheat)), Gelatine, Food Acid (E330), Fruit Juice Concentrates, Colours (E163, Spirulina, E160c, E100), Glazing Agent (Palm Oil, E903), Flavours.